Spaces is a feature in OS X Lion that allows you to have multiple desktops, which can be handy when you’re working in more than one application and in different documents. Spaces is also handy if you have only one display to work with. In this tutorial, we’ll show you how to create additional desktops in Spaces in Lion. There are a few different ways to create new desktops, but they are all very easy. Mission Control is an app used to manage your desktop spaces. The Mission Control icon looks like the icon at the top of this page. To access Mission Control, just click on its icon in the Dock (it’s there by default, next to the Launchpad icon on the left side of the Dock). Since Mission Control is an app, you can also access it in Launchpad or in you Applications folder, or you can press the F3 button on your keyboard. If you have a trackpad, swipe up with three fingers. When you open Mission Control, you’ll see two sections. 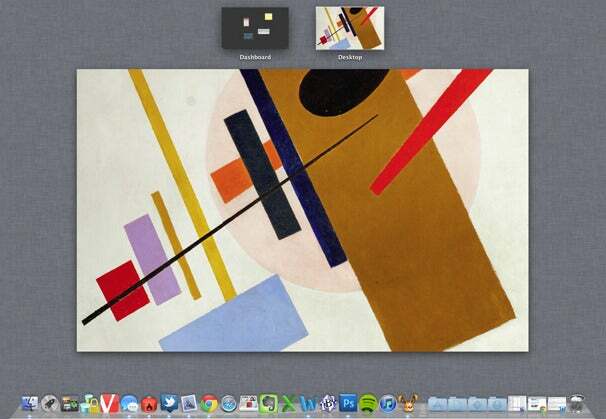 The main section, which takes up most of the center of the screen, is Exposé, which shows your Mac's desktop and helps you find a window on your Mac. On top of Exposé are your desktop spaces. This is where you can manage Spaces. Available desktops appear as thumbnails; the first thumbnail is of the Dashboard, the second is of the desktop. To add another desktop in Mission Control, move your cursor anywhere to the right of the desktop thumbnail. A pop-up with a + symbol will appear in the upper right corner of the screen. Click on it, and a new desktop will appear. Look for the pop-up in the upper right corner of the screen to add a desktop. To get rid of a desktop space, move your cursor over the desktop you want to delete. A circle with an X will appear on the upper left corner of the thumbnail. Also, if you hold down the Option key, the circle-X appears on all of the spaces (except Desktop 1 and the Dashboard). Click the circle-X to get rid of a desktop. You can rearrange the order of the desktop spaces by clicking and dragging them in the order you want. However, you can’t move Desktop 1 or the Dashboard. Each desktop space can have its own wallpaper; go to the desktop whose wallpaper you want to change, and then change it in the System Preferences (System Preferences -> Desktop & Screen Saver -> Desktop; or right-click on the desktop and select Change Desktop Background). You can create up to 15 additional desktop spaces in Mission Control (16 total desktops, plus Dashboard). If you create the maximum number of desktop spaces in Mission Control, you can still add new spaces by going into full-screen mode with an app. Apps that support full-screen mode will have the full-screen icon in the upper right corner. Click on it, and the app goes full screen and creates its own desktop space. When you launch an app and set it to full-screen mode, a space dedicated to that app is created automatically. The catch is that you must be using an app that supports full-screen mode for this to happen. An app that supports full-screen mode will have a pair of arrows in the upper right corner of its interface. When you have an app in full-screen mode, its thumbnail will appear in Mission Control at the end of the thumbnail list with the name of the app instead of Desktop 1, Desktop 2, etc. By default, full-screen apps appear at the end of the spaces thumbnail list. If you add desktop spaces in Mission Control, the new spaces will be added before the full-screen app. You can move the full-screen app by clicking and dragging; if you add new desktop spaces after moving the full-screen app, the new spaces will be added to the end of the list. Also, you can’t delete the full-screen app space in Mission Control; the circle-X button doesn’t appear. Though the system preference for the trackpad says, “Swipe between full-screen apps,” the three-fingered swipe also switches between desktop spaces. Once you’ve added spaces, there are several ways to switch between them. You can use Mission Control; open it, then select the space you want to use. On your keyboard, you can press and hold the Control key and then tap the right or left arrow keys. If you have a trackpad, you can swipe left or right with three fingers. If you plan to use either of these methods, you should go into Mission Control and arrange your spaces in the order you want. These two switching methods move through your spaces in a linear fashion; you can’t skip from, say, Desktop 1 directly to Desktop 5. In Mission Control, you can move non-full screen apps between spaces: select the space with the app, then select the app window in Exposé. Drag the window to the preferred space. If you're not in Mission Control, you can move a window or app to the next or previous space by clicking and dragging the app window to the right or left edge of the screen.